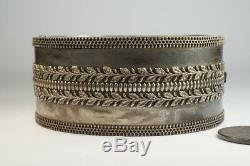 ANTIQUE VICTORIAN ENGLISH STERLING SILVER OAK LEAF & ACORN MOTIF BANGLE c1880. An antique English solid sterling silver bangle, with a hinged snap clasp and decorated with applied oak leaves and acorns. So collectible & ready to wear! CONDITION : All original and generally good. Slight signs of wear, shallow denting & tarnish commensurate with age and use. 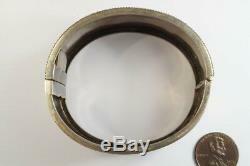 DIMENSIONS : 28 mm wide, 6 ¾ inches long (1 inch = 25.4 mm). 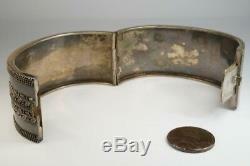 To give an impression of scale, the coin is 19 mm or ¾ of an inch diameter. All orders are sent professionally packed & fully insured for your peace of mind! Please don't forget VAT is payable on all items apart from gold coins! See below for further details. 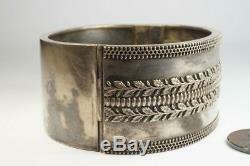 The item "ANTIQUE VICTORIAN ENGLISH STERLING SILVER OAK LEAF & ACORN MOTIF BANGLE c1880" is in sale since Tuesday, October 2, 2018. 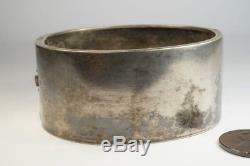 This item is in the category "Jewelry & Watches\Vintage & Antique Jewelry\Fine\Victorian, Edwardian 1837-1910\Bracelets".